I am bastardizing the Zero RB Strategy with this concept, but I think it is a better approach for those of you who hate the running backs on your rosters using the Zero RB. The point of waiting to draft a running back until the fifth, sixth or seventh round, is to eliminate the risk of selecting a running back early who could become a bust. I understand, however, why some fantasy football players are uncomfortable with their starting backs implementing this strategy. With the Zero RB Strategy gaining momentum and popularity, what if it becomes the new way casual fans start to draft and those who don’t are left in the minority? Instead of running back-running back, what if we hear receiver-receiver is the way to draft? Maybe John Connor will send back a terminator to warn us of how not drafting a running back until round five will destroy us all, but I hope we are still several decades away from that happening. At some point in the history of man, I am sure that someone has used this approach in their fantasy football draft. I personally haven’t seen this idea in mainstream circulation, but that doesn’t mean it hasn’t existed before. The approach I am talking about, is what I so lovingly refereed to as a bastardized version of the Zero RB Strategy. I like the idea of finishing drafting your starting receivers by round 4, as it allows you to focus on drafting a quarterback or second running back in the fifth round. 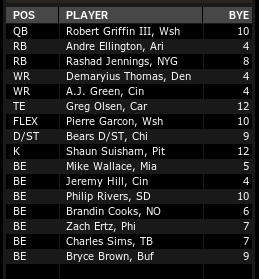 My first team may not look drastically different than some Zero RB teams, but I haven’t seen many of those type of teams land Andre Ellington, Rashad Jennings and RG3. 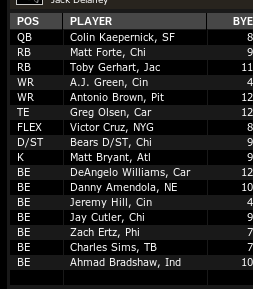 I have stud receivers in A.J. Green and Demaryius Thomas, backs with upside in Jennings and Ellington and a signal caller who has plenty of weapons to make him a top-five quarterback if he can stay healthy. My other teams have top-five running back candidates, strong wide receivers, potential top-10 quarterbacks and running backs who could have break-out seasons. This strategy affords you peace of mind at your running back position, while also owning talented receivers who can compensate for any weak performances from your rushing attack. Some people will say strategies are complete crap in fantasy football, some swear by them and some just believe that you should just draft the most valuable player that is available to you. 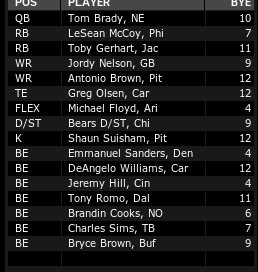 Just like the Zero RB strategy, I want to see if this would work out. I wouldn’t give advice that I wouldn’t follow, and I plan to feature this strategy on my website for my 2014 Fantasy Football Strategy section. I love the teams I drafted with this approach, and I think this concept could help fantasy players win a few championships.